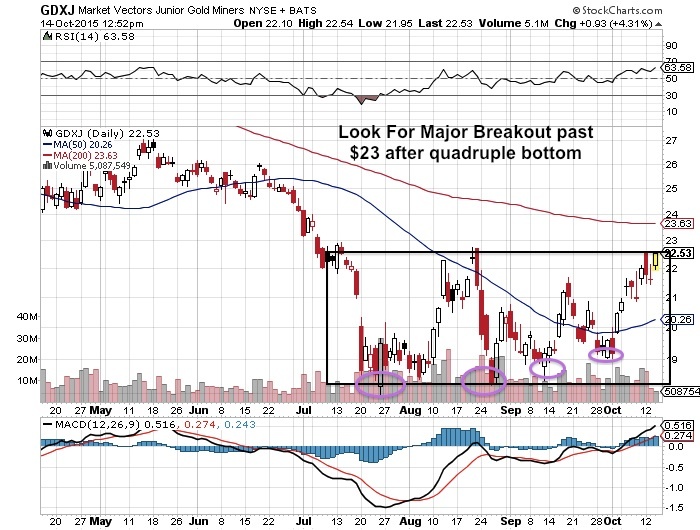 Junior gold miners may be on the verge of a major breakout past three month highs after The Federal Reserve continues to push back interest rate increases. 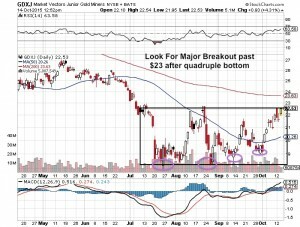 There is a stealth rally underway for junior miners as gold tests resistance after bouncing off its lows in late July. Investors appear to be rotating from the Dow into precious metals as investors may be anticipating even greater easing efforts globally due to China's recent weakness and Yuan devaluation. This could continue to push precious metals, the large miners such as Barrick Gold (ABX) and mid-tiers such as Alamos Gold (AGI) higher. The fear of rate increases that pushed precious metals down is decreasing. The recent rally in precious metals and junior miners may be just beginning as I expect to see increased mergers and acquisitions off of these depressed low prices. A company I have highlighted since the beginning of 2015 is Carlisle Goldfields (CGJ.TO or CGJCF) which traded as much as 40% higher on record volume as they released news that they are in "discussions concerning a potential commercial transaction." Carlisle is currently partnered with NYSE Producer Alamos Gold (AGI) on Lynn Lake up in Manitoba, Canada. It is one of the top open pit gold projects in Canada. NuLegacy Gold (NUG.V or NULGF) was up 22% yesterday after they released news that they completed the 70% earn in with Barrick Gold (ABX). The Iceberg Deposit is adjacent to three of Barrick's huge gold deposits that are the most profitable and safest in the world. NuLegacy spent $5 million USD to earn the 70% interest which is quite impressive in this tough market. Barrick has 90 days to elect to earn back in by spending $15 million USD on the property over 5 years or remain a minority 30% partner. Corvus closed on a $2 million financing with no warrants with a deep pocketed major Private Equity Firm (Resource Capital Fund) in early September and then intersected a gold-silver system on the untested eastern side of North Bullfrog. Jeff Pontius, Corvus Gold CEO stated, “The detection of gold and silver mineralization in the large East Bullfrog target area has the potential to be a game changer for the property as the area is nearly three times the size of the area hosting our current deposits...we believe that Corvus Gold is uniquely positioned in the junior sector to make a major value impact in the coming months." Disclosure: I own Carlisle, NuLegacy and Corvus. NuLegacy and Corvus are current website sponsors. Carlisle was a past sponsor. This is not financial advice and I do have a conflict of interest as I could benefit if the share price increases. Junior Mining stocks are very risky.